At least two people have died in floods that swept through Houston late Sunday and early Monday in what has proven to be the rainiest day in Houston history. The Houston Chronicle reported that more than 121,000 customers were without power in the Houston area at one point. More than 1,000 homes were reported flooded, according to NBC News, and authorities had responded to more than 1,200 flooding emergencies—one man had to be rescued from his car by a TV reporter. The rains and floods also had a widespread impact on municipal services: Bush Intercontinental Airport was hit with more than 550 flight cancelations, and train and bus services were suspended, resulting in a wave of school closures across the region. The heavy rains were the result of a large, slow-moving storm making its way through the region, though experts believe increased heavy rain events in recent years is also the result of climate change. Since the 1950s, Houston has seen a 167%-increase in the heaviest downpours, Slate's Eric Holthaus said. 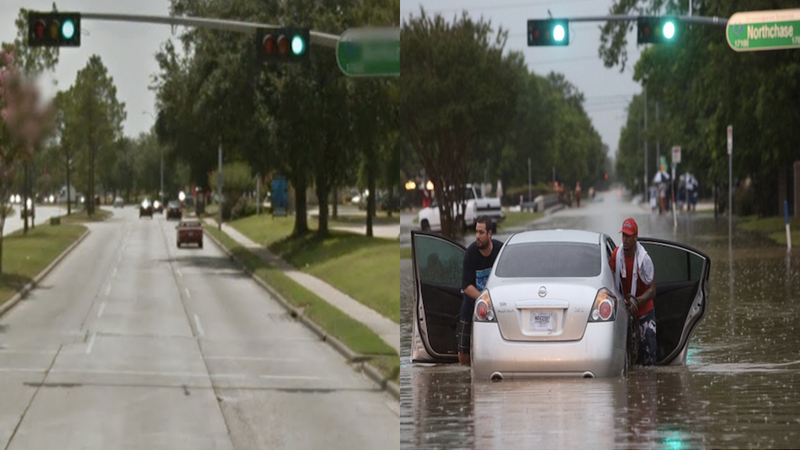 The following are before-and-after photos of parts of the city: first of what they looked like dry on Google Maps, and then what they look like now, according to photos tweeted by intrepid Houstonians.